That was pretty funny to me the first time I read it. Of course, after it settled into my brain a bit more, it became even more amazing. This first grader gets it. She understands the concept of why one would perform such a seemingly simple, yet terribly valuable task. I suppose because this provides such powerful contrast to another recent conversation with a teacher who detailed for me how he helped explain the concept of bookmarking to his high school principal. (yes, garden variety bookmarking- not social bookmarking, as in Delicious, etc.) So yes, just this past month, he walked this principal through the process of bookmarking sites within a web browser for the first time. I frequently rail against the pigeonholing of folks by nearly age alone into Prensky’s (2001) “digital natives” and “digital immigrants.” Kids certainly possess a much higher comfort level with technology, but their proficiency often seems grand only in the eyes of the technology illiterate. I can certainly say that for the high school students I work with, few truly show characteristics of being truly “digital native.” For this, and many other reasons, I really wish I’d stop seeing this term. This weak differentiation can even be rather counterproductive at times. However, my hatred of the phrase weakens a tiny bit hearing stories like this one- not at all because this story makes it true, but because it does allow me to see where people might have generated this idea in the first place. So how do you bookmark a pumpkin?… I think I had just better contact little Riley for the tech specifics of that one. Bell, Darwin. 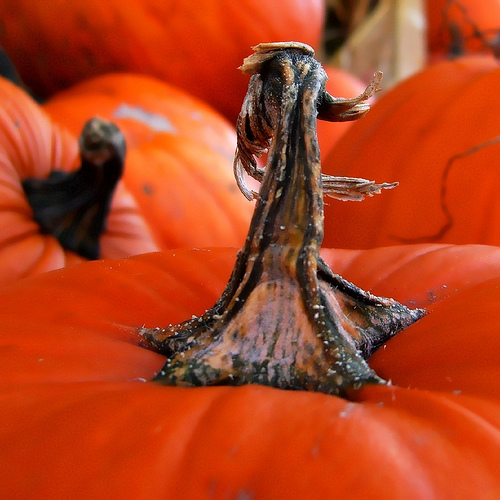 “patch o’ pumpkins.” Darwin Bell’s Photostream. 24 OCT 2007. Flickr. 31 Oct 2008 <http://www.flickr.com/photos/darwinbell/1723126935/>. This is really a great story. Thanks for sharing. But, just because somebody is comfortable beginning to use something does not mean that they have the full capacity to use it to its full potential. @Andrew – thanks for the post. the post on your blog from today runs nicely along the same lines. Good thinking Rylie Bacon. Grandma loves you and enjoyed this pumkin patch story. Extra special thanks for sharing with me Julie. Great Thinking!!! Consider yourself “bookmarked”! Nice. When I first saw the comment here, it was in my “dashboard.” Therefore, It had no real context. Seeing it here at the bottom of the post, makes me laugh. Very appropriate, and thanks. I now consider that to be one of the nicest things a person can say to you.